It is important to note that there may be other health issues that can create similar symptoms, and it is important to get a dog examined by a veterinarian if these symptoms persist. Even if a dog has not had separation anxiety before, it can develop due to traumatic experiences in the dog's life. Dogs that lose their families – being rehomed or adopted from shelters – are often more prone to anxiety issues. Similarly, if a close family member disappears, such as from a death, moving away to college or a divorce, for example, the dog may feel anxious about that loss. Moving from one home to another can also create separation anxiety in dogs, as can traumatic emergencies, such as a major earthquake, severe hurricane or other natural disaster. Fortunately, no matter what the cause, there are several ways to treat separation anxiety in dogs. For mild distress, only simple conditioning treatment may be necessary, but if the dog's anxiety is severe, stronger measures and multiple techniques may be needed to help them feel calm and secure. Before leaving the dog along, provide it with a puzzle treat, a fresh bone to gnaw, a new toy to enjoy or some other pleasant distraction. This will help minimize boredom and help the dog focus on something other than its absent owner. Dogs with separation anxiety quickly pick up on habits that indicate an imminent departure. Picking up car keys, checking locks or putting on a coat are all signs that you are about to leave your dog, and their anxiety will begin. Change those clues to help your dog relax – put on your coat, but sit on the couch to watch television instead. Pick up your keys, but put them in your pocket as you make dinner. The dog will gradually stop associating those clues with being left alone, and its anxiety will decrease. Dogs can grow more anxious if they believe their owner will never return, and they don’t have the memory capacity to realize that a workday is several hours but that you will return. Help your dog realize that being alone doesn't mean you won't come back by first leaving only for short absences, and gradually lengthening those absences to help your dog adjust to longer periods alone. Rewarding a dog's anxiety by a prolonged farewell or excited reunion will only reinforce their behavior. Instead, stay calm and relaxed when leaving or returning, and ignore your dog for several minutes after you get home before greeting them with a kind word or a quick petting. This will help the dog get the idea that coming and going is no big deal and no reason for frantic behavior. Some anxious dogs respond well to crate training, especially if the crate is used for nighttime, meal times or other periods that don't involve being alone. They will learn that the crate is a safe, comfortable space, and they will be less anxious when they have that familiarity every time you leave. Adding an old, recently worn shirt or other piece of clothing with your smell to the crate can help keep the dog calm, since it will remind them you are still nearby. Dogs that are poorly trained, have a bad diet and get inadequate exercise are more likely to develop anxiety issues. Providing your dog with a healthy life that includes a nutritious diet, proper feeding, abundant exercise, firm discipline and good training will keep them more psychologically balanced and able to handle separations without anxiety. If a dog suffers from anxiety just from being alone, it may be helpful to hire a dog sitter or investigate doggy day care options to keep the pet company when you can't be around. This will not be a good solution if the anxiety is severe, however, as the dog will be anxious if you are away, no matter how many other people or pets may still be nearby. There are drug therapy options that can help alleviate a dog's separation anxiety. These treatments should only be undertaken after careful consultation with a veterinarian, however, and only after other, less intrusive methods have been attempted and other potential medical issues and complications have been discussed. 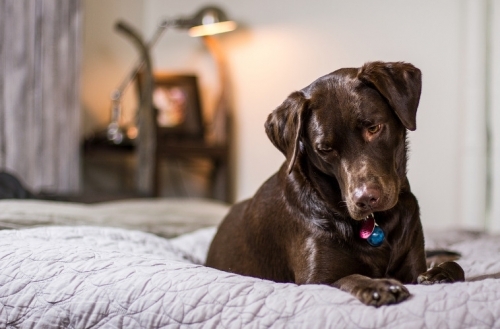 It can be difficult to deal with separation anxiety in dogs, but it is not impossible to overcome this distress so your pet no longer fears being alone.